Easy to install shelving system for all Flat Panel TVs. Provides instant space for mounting your soundbar, speakers, cable boxes, gaming systems and other household items. Holds up to 40 lbs. Easy to install shelving system for all Flat Panel TVs. 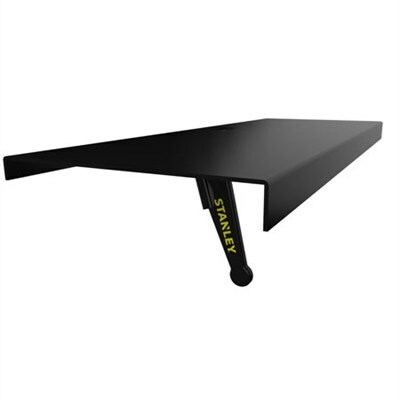 Provides instant space for mounting your soundbar, speakers, cable boxes, gaming systems and other household items. Medium Size TV Top Shelf 12" Wide for digital Apple TV, Roku, Sling, Amazon Fire boxes or speakers. Use two for larger sound bars. Fits all Vizio, Bose, Sons, Son, JBL, Klipsch and other brands. Low profile bezel blends cosmetically into most TVs. Innovative Level and Lock System allows instant adjustment without tools or hardware. Non Slip Surface reduces Speaker vibration and securely holds any item. Made from solid Steel for durability and safely holds 10 lbs. Non-marring rubberized foot and under bezel treatment.